If you own an electric pressure cooker (I have a Pressure King Pro) then the following recipe will will transform a cheap brisket joint into something very special. I love to have it with paccheri rigati pasta, but creamy mashed potato works just as well! 1. Heat the oil in the pressure cooker, using the “stew” function (alternatively, use a separate pan on the hob – I find this is quicker) and brown the joint all over. Remove and set aside. 2. Add the shallots and garlic to the pan and saute for around 10 minutes until beginning to soften and starting to colour. 3. Add all the remaining ingredients except the beef together with some water (about half of the tomato tin). Season with salt and pepper and cook until the sauce begins to thicken. 4. Put the beef and the sauce into the pressure cooker (if using a separate pan), clamp on the lid, making sure the valve is closed and cook for 75 minutes on “Meat”. 5. At the end of the cooking time, carefully open the valve to quick release but leave the meat to rest for 10 minutes before removing. 6. Carve or break apart and serve with the remaining sauce. Sprinkle with parsley, if desired. You will need 100g pasta flour plus 1 egg per person. The quantities below serve 2 as a main course, and 4 as a starter. Place the flour in a food processor with the egg and whizz until it resembles cous cous. Tip out the dough and form into a rough ball shape. Knead briskly for about 1 minute, reform into a ball, wrap in cling film and rest for at least 30 minutes in the fridge before using (but not longer than 3 hours). Cut the dough into 2 pieces. Dust your work surface with semolina flour, then flatten each piece of dough slightly ready to put through a pasta machine. Saturday’s “A Taste of Autumn” was both another enjoyable and convivial evening, thanks to my lovely guests. Whilst the diners chit-chatted, updating old friends, or getting to know new ones, I set about getting the first course on the plates. This was home made Butternut Squash Ravioli with Sage Butter. I had pre-prepared the ravioli and frozen it, to be cooked within minutes in boiling water (the ravioli rise to the top when they are cooked) and finished off with the sage butter and some thin curls of Parmesan. The starter seemed to hit the spot and one of my lovely guests rated it as “tip top”! The main course was a Venison Casserole with Chestnuts, Port and Orange – it looked, smelled and tasted just like Autumn! The venison, flavoured with port, garlic, juniper berries and thyme gave it a rich, rounded flavour and was cooked for several hours, rendering it soft, succulent and tender. I served this with roasted purple carrots (currently available at Waitrose) and creamy potato and parsnip mash, enriched with both butter and cream, in addition to the usual slop of milk. Pudding was a ‘James Martin’ recipe of Spiced Plum Crumble – the plums were gently poached in a syrup of wine, cinnamon, star anise and nutmeg before being buried under a soft crumble mixture. A choice of Vanilla Ice-cream or Vanilla Custard completed the dessert. Preheat the oven to 200 deg.C or Gas Mk 6. Using a large cook’s knife, cut the butternut squash in half lengthways. Scoop out and discard the seeds, then peel the squash and cut the flesh into 2cm dice. Place in a roasting tin, add the halved chilli and whole garlic cloves, pour over the oil and season well. Toss to coat, then roast in the oven for about 30 mins, or until soft and starting to caramelise. Take out of the oven, pop the garlic cloves out of their skins and mash the whole lot together with a fork or potato masher. Beat in the thyme and Parmesan and allow to cool. Now unwrap the pasta dough and cut into two pieces. Work with one piece, rewrapping the other half. Using a pasta machine, put the pasta through the machine at least twice on each setting, stopping at 2 (but including 2). Lay the length of pasta on a work surface dusted with semolina. Using a round cutter (around 10cm) cut circles along the length of the pasta, put scant teaspoons of butternut squash filling in the middle of each round. Dampen the edges with a little water on a pastry brush and fold over to create a semi-circle, pressing in and around the mound to exclude air as you do so. Lay in a single layer on a clean tea towel until ready to cook – no longer than 2 hours or they turn soggy. Repeat the process with the second ball of dough. At this point, you can freeze the ravioli in rigid plastic boxe(s) trying not to overlap the ravioli and placing parchment paper in between the layers and keep in the freezer until needed. Otherwise, place a pan of salted water on to boil ready to cook the pasta. Drop the ravioli into the boiling water to cook until they rise to the surface. (The ravioli can be cooked this way from frozen). For the sage butter, melt the butter in a small pan and heat gently. Add the sage, turn up the heat and cook the butter until it turns palest brown and the sage leaves start to crisp. Do not over brown or burn the butter or sage. Remove from the heat and season with lemon juice, salt and pepper. 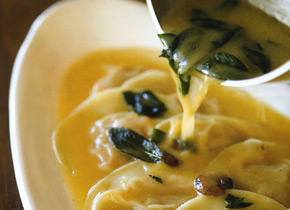 Pour the sage butter over the cooked ravioli and serve with either grated Parmesan or shavings of Parmesan on the top. Preheat the oven to 160 deg.C (Fan 150 deg.C) or Gas Mk 3. Season the venison with black pepper. Heat the oil in a deep, flameproof casserole dish that has a lid and brown the venison for 3-4 mins in batches. Add a little more oil after the first couple of batches if you need to. Once the meat is browned, set aside. Add the onions to the pan and soften on a gentle heat for 5 – 10 mins, scraping any bits that may have got stuck to the bottom on the pan. (These bits really do add flavour to stews, so you want to scrape them off rather than give them the opportunity to burn on the base of the pan.) If the pan feels a little dry, add a drizzle more oil and a splash of water. Once the onions have softened, add the carrots, celery, garlic, thyme, bay leaves and crushed juniper berries. Continue to cook gently for a further 10 mins. Add the flour, stirring to combine. After a couple of minutes, add the orange juice and zest, port, stock, mushrooms and some salt and pepper. Now return the browned venison along with any juices that may have collected in the pan. Bring to the boil, then cover with a lid and pop in the oven for 1 1/2 hours. Stir in the chestnuts and return the dish to the oven. 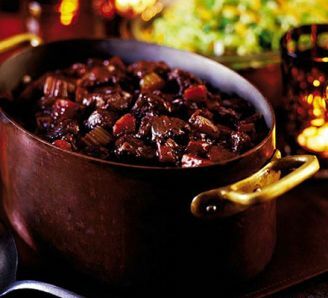 Depending on the venison, the stew will need a further 30 mins – 1 hr to cook through and it is ready when the venison has completely tenderised.